What is the value of the fiscal multipliers today? 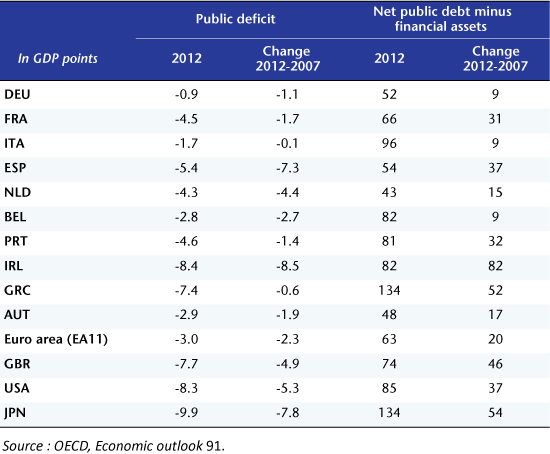 We inherited higher public deficits and greatly increased public debts from the crisis (Table 1). Reducing these will require a major fiscal effort. But a programme that is too brutal and too fast will depress activity and prolong the crisis, not only compromising the fiscal consolidation effort but also locking the economies into a recessionary spiral. The value of the fiscal multiplier (the link between fiscal policy and economic activity) both in the short term and in the long term is thus a critical parameter for stabilizing the public finances and returning to full employment. When the multiplier (in the short term) is greater than approximately 2 (actually 1/a, a being the sensitivity of the public deficit to the economic cycle and valued at about 0.5 in the developed countries), then fiscal cutbacks produce such a decrease in activity that the short-term deficit increases with the cuts. When the multiplier is greater than approximately 0.7 (in fact, 1/(a+d), d being the ratio of debt to GDP), then fiscal restraint increases ratio of debt to GDP in the short term. In the longer term, things get complicated, and only a detailed modelling can help to understand in what circumstances today fiscal restraint would lead to a sustained reduction in the debt-to-GDP ratio. The value of the multiplier in the medium term is of course crucial (it is usually assumed to be null, or zero, but in the case of cost-effective public investment, this assumption does not hold), but hysteresis effects as well as changes in expectations about inflation or about sovereign interest rates (and therefore the critical gap, i.e. the gap between 10-year sovereign bond rates and the economy’s nominal potential growth rate) interact with changes in the debt and in GDP. The multiplier is higher in “times of crisis” (in the short term or as long as the crisis lasts). 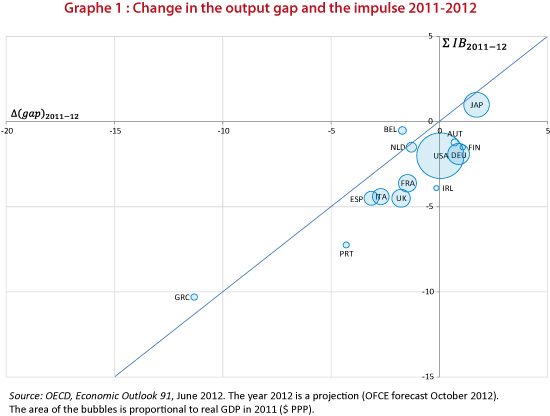 In “times of crisis” means high unemployment or a very wide output gap. Another symptom may be a situation where safe long-term interest rates are very low (i.e. negative in real terms), suggesting a flight to safety (radical uncertainty) or a liquidity trap (expectations of deflation). Two theoretical interpretations are consistent with these manifestations of the crisis. One, price expectations are moving toward deflation, or radical uncertainty makes it impossible to form an expectation, which is consistent with very low safe interest rates and leads to the paralysis of monetary policy. Or second, more economic agents (households, firms) are subject to short-term liquidity constraints, perpetuating the recessionary spiral and preventing monetary policy from functioning. In one case as in the other, the fiscal multipliers are higher than in normal times because the expansionary fiscal policy (resp. restrictive) forces the economic agents to take on debt (resp. shed debt) collectively instead of individually. In “times of crisis” the multiplier is in play including when it is anticipated and its effect persists until a return to full employment. The multiplier is higher for expenditures than it is for compulsory levies. The argument in normal times is that higher compulsory levies acts as a disincentive and spending cuts as an incentive on the supply of labour. In a small open economy, when monetary policy also induces a real depreciation of the currency, fiscal restraint can increase activity, a result that has long allowed supporters of fiscal discipline to promise all kinds of wonders. But in times of crisis, in addition to the fact that the multipliers are higher, the logic applicable in normal circumstances is reversed. The use of taxes as disincentives for the labour supply or spending cuts as incentives does not work in an economy dominated by involuntary unemployment or overcapacity. It is in fact the expectations of a recession or of deflation that act as disincentives, which is another factor indicating high multipliers. Econometric estimates (based on past experience of “times of crisis”) lead to retaining a fiscal multiplier of around 1.5 (for an average mix of spending and compulsory levies). Taking together 2011 and 2012, years in which a very strong fiscal impulse was carried out, confirms this econometric evaluation. By comparing on the one hand changes in the output gap from end 2010 to 2012 (on the abscissa) and on the other hand the cumulative fiscal impulse for 2011 and 2012, we obtain the short-term impact of the fiscal consolidation. Figure 1 depicts this relationship, showing a close link between fiscal restraint and economic slowdown. For most countries, the “apparent” multiplier is less than 1 (the lines connecting each of the bubbles are below the bisector, the “apparent” multiplier is the inverse of the slope of these lines). Figure 2 refines the evaluation. 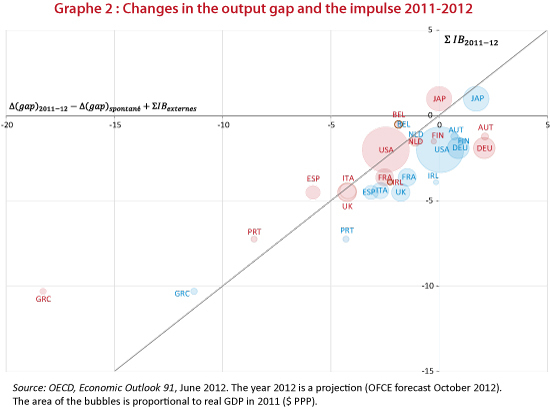 The changes in the output gap are in effect corrected for the “autonomous” dynamic of the closing of the output gap (if there had been no impulse, there would have been a closing of the output gap, which is estimated as taking place at the same rate as in the past) and for the impact of each country’s budget cutbacks on the others through the channel of foreign trade. The bubbles in orange therefore replace the blue bubbles, integrating these two opposing effects, which are evaluated here while seeking to minimize the value of the multipliers. In particular, because the output gaps have never been so extensive, it is possible that the gaps are closing faster than what has been observed in the last 30 or 40 years, which would justify a more dynamic counterfactual and therefore higher fiscal multipliers. Austria and Germany are exceptions. As these two countries enjoy a more favourable economic situation (lower unemployment, better business conditions), it is not surprising that the multiplier is lower there. Despite this, the “corrected apparent” multiplier is negative. This follows either from the paradoxical effects of the incentives, or more likely from the fact that monetary policy is more effective and that these two countries have escaped the liquidity trap. But the correction provided here does not take into account any stimulus from monetary policy. In the United States, the “2011-2012 corrected apparent” multiplier comes to 1. This “corrected apparent” multiplier is very high in Greece (~ 2), Spain (~ 1.3) and Portugal (~ 1.2), which is consistent with the hierarchy set out in point 1. This also suggests that if the economic situation deteriorates further, the value of the multipliers may increase, exacerbating the vicious circle of austerity. For the euro zone as a whole, the “corrected apparent” multiplier results from the aggregation of “small open economies”. It is thus higher than the multiplier in each country, because it relates the impact of the fiscal policy in each country to the whole zone and no longer just to the country concerned. The aggregate multiplier for the euro zone also depends on the composition of the austerity package, but especially to the place where the measures are being implemented. However, the biggest fiscal impulses are being executed where the multipliers are highest or in the countries in the deepest crisis. The result is that the aggregate multiplier for the euro zone is 1.3, significantly higher than that derived from the US experience. A comparison of the fiscal plans for 2011 and 2012 with the economic cycle in those years yields a high estimate for the fiscal multipliers. This confirms the dependence of the multiplier on the cycle and constitutes a serious argument against the austerity approach, which is to be continued in 2013. Everything indicates that we are in a situation where austerity is leading to disaster. There has been an intense debate about the theoretical and especially the empirical validity of these assertions (see Creel, Heyer and Plane 2011 and Creel, Ducoudré, Mathieu and Sterdyniak 2005). Recent empirical work undertaken for example by the IMF has contradicted the analyses made ​​in the early 2000s, which concluded that anti-Keynesian effects dominate Keynesian effects. Thus, at least with regard to the short term, before the crisis and in “normal times”, the diagnosis today is that the fiscal multipliers are positive. The endogeneity of measurements of a fiscal impulse by simply varying the structural deficit interfered with the empirical analysis. The use of a narrative record of fiscal impulses addresses this issue and significantly alters estimates of the multipliers. In most macroeconomic models (including dynamic stochastic general equilibrium – DGSE – models), the fiscal multipliers are also positive in the short term (on the order of 0.5 for a pure fiscal shock “in normal times”). In the long run, the empirical analysis does not tell us much, as the noise drowns out any possibility of measurement. The long term therefore reflects mainly an a priori theory that remains largely dominated by the idea that fiscal policy can have no long-term effect. However, in the case of public investment or of possible hysteresis, the assumption of a non-null effect in the long run seems more realistic. ← A review of the recent literature on fiscal multipliers: size matters!